Prep time: 20 minutes. Cooking time: 20-25 minutes. Makes approx. 20 pakoras. One summer, fresh out of our undergraduate degrees, I shared a brightly-lit apartment with one of my best friends, Sarah: vegetarian cook extraordinaire and dinner party wizard. She taught me how to make pakoras in our very narrow kitchen to the soundtrack of Al Green’s Greatest Hits, and we served them to guests with homemade chutney (recipe below) and minty-mango gin fizzes. I’ve been making them ever since. The crunchy seeds in these pakoras add the nutrients that an active vegetarian needs, but even more so, imitate the crisp and crunch of a real deep-fried pakora. They are unparalleled when cooked in Level Ground’s aromatic, flavour-rich coconut oil—I know of no satisfactory substitute for this. Serve hot and enjoy! 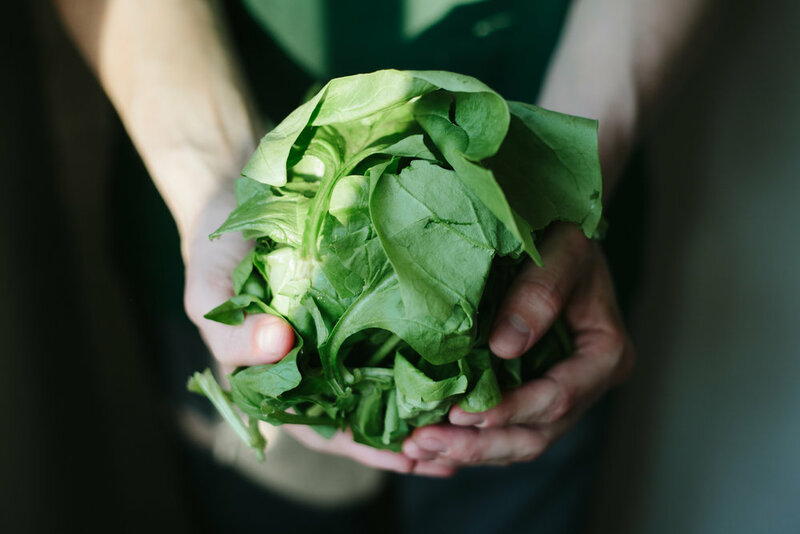 Chop or tear spinach until pieces are small—almost bite size. Mix chickpea and rice flours with turmeric, cumin, chilli flakes, pepper, and salt. Mix vegetables and dry ingredients together in one large bowl. Add your roasted seeds. Mix. Add water. Mix well with fork. Ingredients should clump easily. The flour should turn into a thick paste and hold the veggies and seeds together. Add more water if needed, 1 tbsp at a time. Add ¼ cup coconut oil to large frying pan, or more if your pan is larger. You are trying to imitate the effect of a deep fryer, as much as possible, so the more oil the merrier. (Though be careful of spitting oil!) Your oil should be thick—just under ¼ inch high. Heat oil to just under medium (4 on my oven). Prep time: 5 mins. Cook time: 15 mins + long rest while you make your pakoras. Place all chutney ingredients in small frying pan or saucepan, bring to boil over medium heat. Stir. After a few minutes, lower heat to a simmer and let chutney sit covered for 10 min, checking occasionally and stirring if necessary. Do this until chutney reaches desired consistency (should be the viscosity of a compote, or a jam that hasn’t yet set). Turn off heat and keep chutney covered, on the element you just turned off, until you’re ready to serve. Five minutes before serving, turn heat to low for 3-5 minutes to warm up chutney. (Thank you to our friend Blythe Kingcroft for the recipe & photos). This yellow-orange curry is slightly sweet in nature—because of the cinnamon, squash, and violet rice—and can be adjusted to accommodate your desired spice level. The acid in the tomatoes cuts the sweetness beautifully and the coconut milk (full fat for best results!) balances out any spice to create a rich, protein-packed vegan dinner. Serve over a bowl of Violet Rice. 2. Grate ginger and garlic. Set aside. 3. 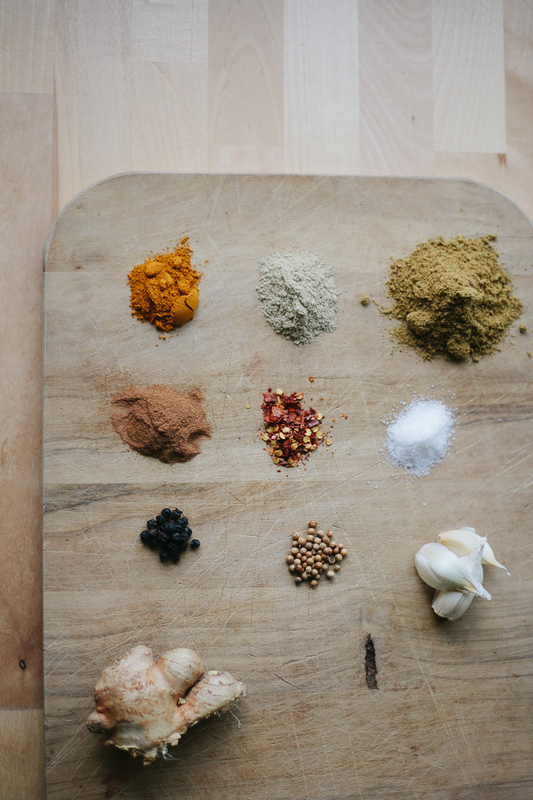 Measure cumin, coriander, cardamom, turmeric, cinnamon, chili flakes, salt and pepper into one bowl. Mix. Set aside. This is your curry! 4. Cut up onion into one-inch pieces, or smaller if preferred. 5. Add coconut oil to your pan, and heat it over medium-high heat (6-7 on my oven). 6. Add onion, grated ginger and garlic. Stir. After a few minutes, add spices. Keep stirring until onions are a little translucent and showing signs of sticking. When this happens, add ½ c. water. Cover and let it boil down, about 5-7 minutes. Your onions should be nice and soft, and evenly coated in the colour of the spice. 7. Add butternut squash and enough water to cover onions and squash (approx. ¾ cup, maybe more). Cover, let boil down for 10 minutes at medium temp (approx 5 on my oven). Check halfway; you may need to add more water. After 10 minutes, check softness of squash with a fork. You should be able to pierce it easily by now. 8. Rinse chickpeas. Add and stir gently. (At this point, your squash will be soft enough that vigorous stirring could turn it to mush.) Let sit 3-4 minutes. 9. Strain diced tomatoes. Gently stir in tomatoes and coconut. 10. Cover and let sit 5 minutes. Taste. Want it spicier? Add more chili and/or pepper. Taste bland? Add more salt to bring out flavour. Want it sweeter? Add a bit of cinnamon. Go easy when adding spices at this stage, as a little can go a long way. 11. Cover again and let sit for 5-10 more minutes, depending on how thick you like your curries. This will produce a good bowl curry: something between a soup and a stew, with enough liquid that a plate won’t do. 12. Add cooked rice to bowls. Spoon generous amounts of curry on top. Top with pinch of flake salt, pinch of chilis, and a sprinkle of cinnamon. Enjoy!